Last night’s dinner at the albergue was over the top. I debated briefly before deciding to eat there because I was craving meat and papas fritas. I’m really glad I decided to stay because they were serving vegetarian paella which is cooked in this big clay pan. We started with appetizers and a choice of three wines followed by an amazing salad. 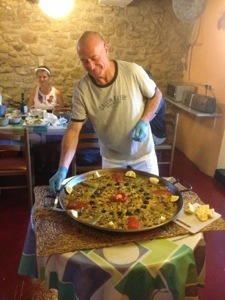 Then with a flourish, chef Miguel entered the room with a huge pan of paella garnished with red peppers and dates. I’ve never tasted this dish before, but I can recommend it highly. You may need to travel to Villatuerta to enjoy it however. After the paella and a bit of wine, I slept really well. There were only two of us in the room so no earplugs were needed (at least for me). I woke up around 6 am and slowly got organized. 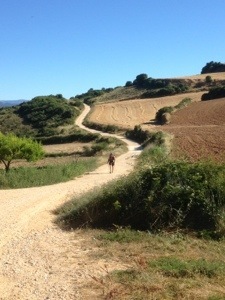 Nancy (see last blog) had walked the Camino before and she asked if I would join her on the scenic bypass around Estella. I had noticed it in the guidebook but probably wouldn’t have taken it on my own. We finally got rolling around 7:30, found the turnoff to the scenic route and quickly got out of town. The path immediately turned to single track and then overgrown single track. Luckily there were the familiar signposts so we kept going no matter how sketchy the path became. At one point we crossed a bridge over a very clear river so I immediately checked for signs of trout. Immediately below me under the bridge was a 24-inch trout. That’s it. Next time I’m bringing my fly rod. One of the features of the scenic route was that it passed through very few towns. In fact, there was only one town along the entire 15 mile path. I had gone shopping the night before so I had enough food and water the make it to the town. We stopped for lunch around 1130 and it was already really warm. There was a pool at the restaurant but I didn’t have time to enjoy it. 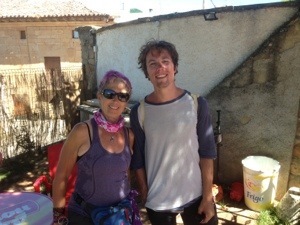 At the lunch stop was Tim, a guy from Australia that I had walked with a bit yesterday. Tim is currently living in Wurzburg, Germany where he dances in the local ballet company. I looked at the map and I calculated about 10 km to our final destination, Los Arcos. What I didn’t calculate, however, was the heat of the midday sun and the absence of any shade along the way. There were some nice hills thrown in for good measure. By this time it was over 80 degrees and we were walking on light colored gravel roads that bounced the heat back in our faces. I had enough water so I was trying to power it down, Grand Canyon style. I don’t think I could have walked another step after reaching the town. 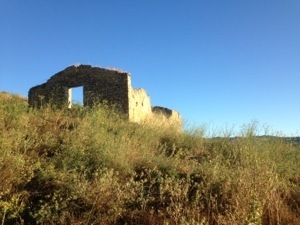 The recommended albergue, Casa de la Abuela, was already full so I settled in at the also recommended Casa la Fuente. Definitely a step down from last night but quite adequate. A number of my friends from last night are also staying there.